"Paradigms are powerful because they create the lens through which we see the world... If you want small changes in your life, work on your attitude. But if you want big and primary changes, work on your paradigm." Develop an outcome oriented mindset in every activity they engage in projects, meetings, presentations, contributions, etc. Eliminate energy and time-wasting tendencies by focusing and executing on the team's wildly important goals with a weekly planning cadence. Build Leaders At Every Level Of Your Organization - increasing productivity, restoring balance, and developing greater maturity and responsibility. The 7 Habits for Associates® helps your employees tap into the best they have to give. They become empowered with new knowledge, skills, and tools to confront issues, work as a team, increase accountability, and raise the bar on what they can achieve. 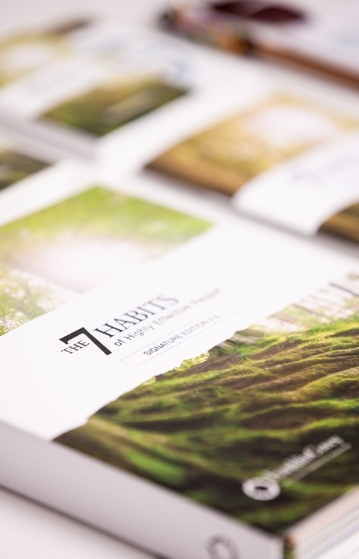 The 7 Habits Interactive Edition enables all your employees-regardless of work location-to reach the highest levels of effectiveness and productivity and feel a stronger sense of cohesion. 7 Habits Maximizer extension course helps participants "hard-wire" their commitment to principles of effectiveness, which in turn improves the dynamics of your organization. This 360 assessment gathers input from key associates-direct reports, coworkers, and supervisors-to help individuals gain a clearer picture of their performance from a range of perspectives. In The 7 Habits of Highly Effective People Hindi Program, participants learn how to: take initiative, balance key priorities, improve interpersonal communication, leverage creative collaboration, and apply principles for achieving a balanced life.